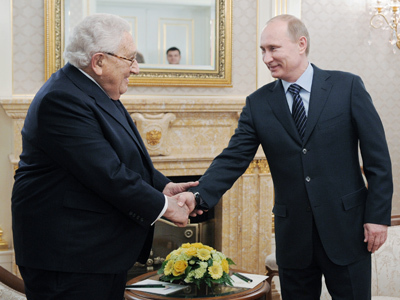 US foreign policy veteran Henry Kissinger visited Moscow and met with Vladimir Putin on January 20th. Political analyst Igor Panarin believes this meeting marked the launch of a new dialogue on the future shape of US-Russia relations. The meeting between Prime Minister Vladimir Putin and one-time Secretary of State Henry Kissinger was not only intended to improve the controversy-ridden relations between Russia and the United States, but also to contribute to stabilizing the inside political situation in both countries. After two months of relative calm last year, Occupy rallies resumed with renewed fervor in various cities across the US. The surge in street protests was coupled with a new political battle between America’s Democrats and Republicans in Congress over a sudden increase in the US national debt. The difficult compromise negotiated by President Barack Obama on 2 August 2011, which had allowed Washington to avoid a sovereign default, turned out to be a mere respite. By mid-November 2011, US public debt had topped $15 trillion, putting America on the brink of default yet again. On 13 January 2012, President Obama requested the House of Representatives to raise the US debt limit by another $1.2 trillion. This was supposed to be a mere formality, prearranged by the President’s deal with Congress struck back in August. The White House estimated that the new increase in the debt ceiling would help the administration avoid a default until the nation would be through with the presidential election scheduled for November. But what had been expected to be a rubber-stamping procedure, suddenly turned out to be a stonewalling when the House voted down the president’s request on January 18th. This unexpected violation of the deal between the White House and Congress has effectively undermined Barack Obama’s chances of re-election, and subsequently intensified the already ferocious infighting among the Republican presidential nominees. Former House Speaker Newt Gingrich soared in the polls after Texas Governor Rick Perry dropped out of the race, urging his supporters to back Gingrich. The crucially important South Carolina primaries brought Gingrich 40 percent of the poll, while his main competitor, Massachusetts Governor Mitt Romney scored 27 percent. The official GOP candidate to challenge Obama at the November election will be apparent by the summer. The world of Russian politics has been concurrently heating up since the parliamentary election in December. For the first time in many years, protest rallies attracted dozens of thousands in Moscow and several other cities across the country. The surge in domestic debate in both countries came at a time of yet another chill in US-Russia relations over global missile defense, as well as Russia’s stubborn opposition to Washington’s push for military intervention in Syria and Iran. Vladimir Putin has previously referred to Henry Kissinger on numerous occasions as a foreign policy expert whose opinions are highly valuable. In his book published in 2000 and titled In the First Person: Talking to Vladimir Putin, the Russian leader gives a glowing account of his first encounter with Kissinger in the early 1990s. Kissinger strongly impressed Putin during their first conversation, telling him about his own background in intelligence. He also opined that Mikhail Gorbachev’s decision to withdraw Soviet troops from Eastern Europe in the late 1980s was premature, adding that he had never quite understood Gorbachev’s motivation. The one-time chief of US diplomacy is still considered an outstanding expert in international relations today. His credentials as one of the prime architects of the US-Soviet détente in the 1970s are the reason why his meeting with Vladimir Putin on January 20th focused primarily on promoting the dialogue between Moscow and Washington. The Russian Prime Minister set the tone for the meeting, cordially addressing Kissinger in his welcoming speech: “You and I have a long-standing history of highly positive relations. I consider you one of the most sophisticated foreign policy experts, including the area of US-Russian relations.” Kissinger promptly returned the compliment. The account of the meeting and its context invite a number of conclusions. The meeting took place merely four days into Michael McFaul’s tenure as US Ambassador to Russia, signifying acknowledgment of the fact that the two countries’ relations are strained and ridden with tension, which can possibly upset the balance of power, and have an adverse affect on stability, globally. Kissinger’s underlying task of reintroducing shuttle diplomacy to US-Russia relations reveals that the two nations’ foreign-policy makers have exhausted their options for compromise over the contentious missile defense issue, which is becoming ever more evident as both parties increasingly tend to resort to Cold War-style rhetoric and accusations. A clear-cut example of the latter can be found in the recent public statement made by Russian Space Agency Director Vladimir Popovkin, who suggested that the US might be behind the mysterious crash of Russia’s Phobos-Grunt satellite. The White House seems somewhat surprised by Russia’s dramatically toughened attitude vis-à-vis Washington’s drive for a military operation against Syria or Iran. The public statements circulated by the Russian Foreign Ministry and National Security Council on 12 January 2012 were reinforced by an impressive naval exercise performed by a Russian aircraft carrier group in the Mediterranean. The wargame demonstrated Russia’s growing military potential, as well as its readiness to step in to prevent a Western military gamble in the Middle East. The Putin-Kissinger meeting offered one of the few remaining opportunities to avoid a further escalation of tension between Russia and the United States. It becomes even more meaningful once you consider that Vladimir Putin is an undisputed presidential frontrunner, while Henry Kissinger happens to be a foreign policy guru for GOP, whose candidate is highly likely to become America’s next president, come November. I am convinced that friendly relations based on mutual respect and a balance of interest would benefit both Russia and the United States. I hope such meetings will continue and eventually contribute to easing the tension in US-Russia relations.